Everything old is new again. It works in the land of clothing, style and fashion and it absolutely has it’s place in the world of music gear. 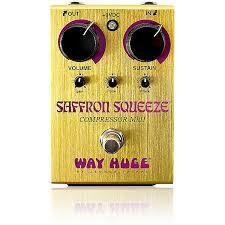 Take the new 2015 Saffron Squeeze offered up by Way Huge. It’s a new take on an old pedal with some fantastic updates for our new, modern times. Way Huge describes it as this: “The MkII has all of the love honey sustain and dripping compression of its predecessor, but now you can shape and mold it just the way you like it. In addition to the MkI’s Volume and Sustain controls, this revitalized rascal now has a Gain control to set the input gain level, a Tone control to cut post-compression high-end, and an Attack control to set the compressor’s reaction speed.” So take that yesteryear! The process of taking a beloved pedal and adding features to expand its use is a trend I hope we see more of. It’s all well and good to create new boxes with features not yet discovered, but reaching back into the decades and pulling similar sounds out with a bit more of this or a little different that is a fun way to pay homage to the sounds of years past. Making sure that it’s done well and that the new pedal has more than a change of color and a few new buttons is the real trick and it appears that Way Huge has succeeded here. Check out a demo and hear for yourself below. And don’t forget we have a contest going on where you could win an Outlaw Effects Five O’clock Fuzz. Good, Good stuff. Check it out, Like Pedal Finders FB page and enter to get your chance for free gear! Looks like a great addition to the current Way Huge line, and I couldn’t help but notice the Blue Hippo Chorus MkII on the board, which also is to be released soon I believe. I like the rather unusual controls of the Saffron which seem to be a bit more intuitive to me and the pedal seems to be as good sounding as any other WH offering; so relaxed and smooth performing. Was about to purchase a T-Rex compressor, but this would be more up my street I assume.